Aitken’s body of work ranges from photography, sculpture, and architectural interventions, to narrative films, sound, single and multi-channel video works, and installations. Recently he has recorded conversations; for example, in 2006 he made Broken Screen: 26 Conversations with Doug Aitken, a book of interviews with twenty-six artists who work with and challenge the conventions of linear narrative, such as directors Robert Altman and Werner Herzog. The Idea of the West (2010) presents the collective response of 1000 people on the street who were asked “What is your idea of the West?.” Currently, he can be seen in the Liverpool Biennial, with a work entitled Doug Aitken – The Source. 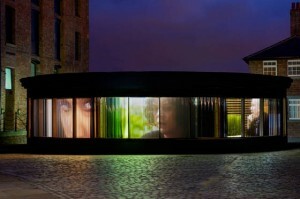 It is situated in a pavilion on the Albert Dock, designed by Aitken in collaboration with British architect David Adjaye. In the film, various people such as Beck, Jack White, Tilda Swinton and several other artists discuss the roots of creativity. Aitken calls this a “pavilion of ideas”.